Here is a thing everyone wants: A miracle.Here is a thing everyone fears:What it takes to get one.Any visitor to Bicho Raro, Colorado, is likely to find a landscape of dark saints, forbidden love, scientific dreams, miracle-mad owls, estranged affections, one or two orphans, and a sky full of watchful desert stars. At the heart of this place you will find the Soria family, who all have the ability to perform unusual miracles. And at the heart of this family are three cousins longing to change its future: Beatriz, the girl without feelings, who wants only to be free to examine her thoughts; Daniel, the Saint of Bicho Raro, who performs miracles for everyone but himself; and Joaquin, who spends his nights running a renegade radio station under the name Diablo Diablo. They are all looking for a miracle. But the miracles of Bicho Raro are never quite what you expect. Okay I liked the idea of the story, but that was about it. I just don't enjoy omnipresent narrators who speak as though they are the child of [a:Lemony Snicket|36746|Lemony Snicket|https://images.gr-assets.com/authors/1199734355p2/36746.jpg] and [b:Welcome to Night Vale|23129410|Welcome to Night Vale (Night Vale, #1)|Joseph Fink|https://images.gr-assets.com/books/1447774088s/23129410.jpg|42677282]. The book was too slow for me and too much extraneous, irrelevant detail. Sorry Maggie, you just didn't win me over this time. 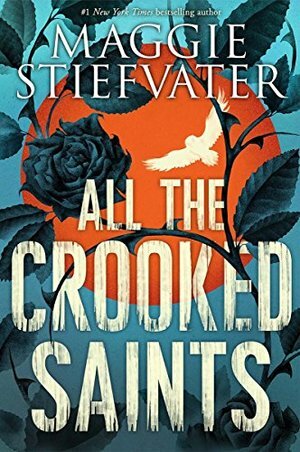 Stiefvater's latest novel was something I had been waiting for since it was announced. I have not been over the Raven Cycle series, of course, and a standalone book about miracles and owls written in her style was exciting. The story is pretty simplistic in that there is a town in New Mexico where a family of saints perform miracles for you to be able to see your darkness, but they cannot help you vanquish it directly. Beatriz's generation of the Sorias have been seeing an influx of these pilgrims but many of them haven't performed their second miracle (the one in which they banish their darkness) and left, making the three cousins wonder if this is the right way to go about their family business. The start of the book involves the introduction of two new characters to the town - Tony,a radio show host as a pilgrim, and Pete, a young man who is about a truck. The story is told in an omniscient third person narrative, so in the audiobook you get Thom Rivera narrating the story of the Sorias in a lightly amused tone, and which often feels like he is telling you to come by and listen to a bedtime story. Honestly, the best part of the book may have been the narration, because it brings out the whimsy of a modern fairytale, which is what the story is more like, rather than an urban fantasy. The characters are described as fallible humans, who, over the course of the book, undergo self-introspection and realize truths about themselves and the world. It is light-hearted, though, for the most part, with humor injected into most chapters. The story, overall, feels very simplistic, however. I don't know if it is because it was a standalone, or because most of the book goes into the characters, or because I expected more, but the story feels very rudimentary, in a way. It feels like a slice of a larger story. The writing is more atmospheric than any of her books earlier, and she often uses her style of repeating phrases to create emotion or significance in the text. It is a nice story to hear, but probably not as much fun as only reading, if you get my meaning. Eventually, I was hovering at a 3.5 stars by the end of the book, but I couldn't make myself round it up to 4 stars for Goodreads, so here is where we are. A well-written book, but if you have read The Scorpio Races or the Raven Cycle, it feels lacking. It behooves me to inform readers that this book has been controversial for the author's misappropriation of Mexican culture as well as magical realism. Since I am neither Mexican or Latinx, I will not comment on whether I found the rep to be respectful, but I do acknowledge that multiple people have spoken about it and that their concerns are valid. That being said, I have mostly read this as a work created by a white author in a genre that is inherently not hers, a white author writing about POC and so I would advise you to read it in that vein, rather than an exploration of Mexican culture. Initial Impressions 10/13/17: Every Maggie Stiefvater read is such a unique experience and it's something I love and wholly appreciate. It does, however, lead to some unpredictability for whether I'll be wholly invested and re-read the book a million times (THE SCORPIO RACES, THE RAVEN CYCLE) or just really not connect with it (SHIVER). Unfortunately, ALL THE CROOKED SAINTS was not a hit for me. This book is absolutely character driven, as are all of Maggie's books that I've read, but this book was SO character-driven that I didn't really feel like there was much of a plot. That's okay -- I don't always need that -- but I needed it with this book, especially with so much magical realism in the concept of miracles and how that affected all of the characters. I was especially sad that I didn't connect with really any of the characters. The potential was there but there were so many that the focus got spread out and we didn't get to see that core development that I love so much. No wait. Strike that -- because there are tons of characters in The Raven Cycle and I still love every single one of them, even the freakin' crazy ones. So yeah... I guess it just wasn't there for me. The concept was interesting but ultimately didn't take me anywhere and I didn't feel like I got anything special from the book. I'm glad I read it because it's Maggie and I will read whatever she writes but I'm pretty bummed with this one. At least with SHIVER I could tell it was more the concept of wolves that I wasn't loving but this didn't seem to really move, even for a character-driven book.